Seeing as how I’m trying to find ways to kick up my workouts by a notch or so, as I get closer to the next marathon, it seemed only fitting that I try out workout weights. I’d been intrigued by them before, since they seem to come in so many flavors – things that wrap around your ankles, things that wrap around your wrists, things that wrap around your waist, etc. So, when I was offered a chance to try out weights that you hand-carry, I was definitely interested in seeing how well they worked. 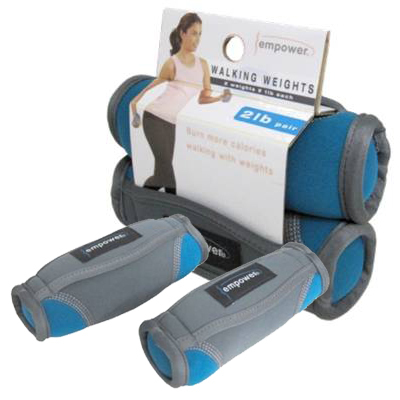 The product I tested is a 2lb pair walking weight set from Empower Fitness; the set is 2lb total (1lb per weight). These are supposed to be designed specifically for women, and the softness of the sand inside them certainly did make them comfortable to hold. They’re enclosed in a bit of neoprene, with a neoprene strap to go around your hand – again, all quite comfy stuff. According to the Empower Fitness web site, the set retails for $9.99. I did a bunch of walks with these, both indoors and outdoors, ranging from as little as a half-hour to just over an hour. Distances covered were anywhere from 1.5 – 4mi, with my pace ranging between 17-20min/mi. Typically, I was walking holding my arms parallel to my body with my forearms approximately 90 degrees off from my upper arm. Holding the weights seemed to force me to have better posture and hold my core muscles tighter than I typically would without the weights. I liked them! They were comfortable to carry and they were light enough to be easily carried in one hand if needed, yet heavy enough to give me just that little bit of resistance I needed to make my walk a bit more of a workout than it was previously. The straps made it easy to hang onto them, and the squishiness from the sand meant that they had plenty of give for me. If I needed to put them aside so I could get a drink, if I was indoors and on a treadmill, it was easy enough to put them on the shelf in front of me. When I was outside, they were light enough to transfer to one hand and carry as 2lbs on one side while I got my drink. It’s a handy thing that you can wipe them down if you need to, although I will say that no matter how sweaty my hands got from wearing them during walking workouts, they never got stinky (big plus!). They never slipped off my hands due to sweat; they really seemed to fit my hands perfectly with those straps, and I appreciated the comfortable, tight-but-not-constrictive fit of the straps. If you’re interested in spending short dollars to add a little oomph to your walks, I’d recommend giving these a try. I’ll definitely continue using them, and don’t be surprised if I purchase a carabiner to allow me just to clip them to a belt-loop for much longer walks when I want to alternate using/not using them. For my walks around my neighborhood, I often eschew wicking fabric in favor of my boy cargo shorts; they just make it a ton easier to carry stuff (granola bars, iPhone, etc.). Hence – a carabiner + these weights (or two carabiners, so I can clip one to each side) is a VERY likely outcome for future walks. You can purchase these at various places online, including Amazon.com . Check out the Empower Fitness web site for full details on purchase options. This entry was posted in fitness, product reviews, walking and tagged empower fitness, exercise, product review, review, walk, walking, walking weights, weight loss, weights by crunchymetromom. Bookmark the permalink.